YouTube is a video sharing service with a wide range of content to choose from. You can watch anything from movies, music videos, fitness videos, makeup tutorials and pretty much everything you can think of. Android: Launch YouTube > Navigate to Account (top right) > Settings > General > make sure Autoplay is in the OFF position. iOS: Launch YouTube > while playing a video, there will be a Autoplay setting below the video. Make sure it is in the OFF position. Android: Launch YouTube > Navigate to Account (top right) > Settings > General > Uploads > select preferred setting. 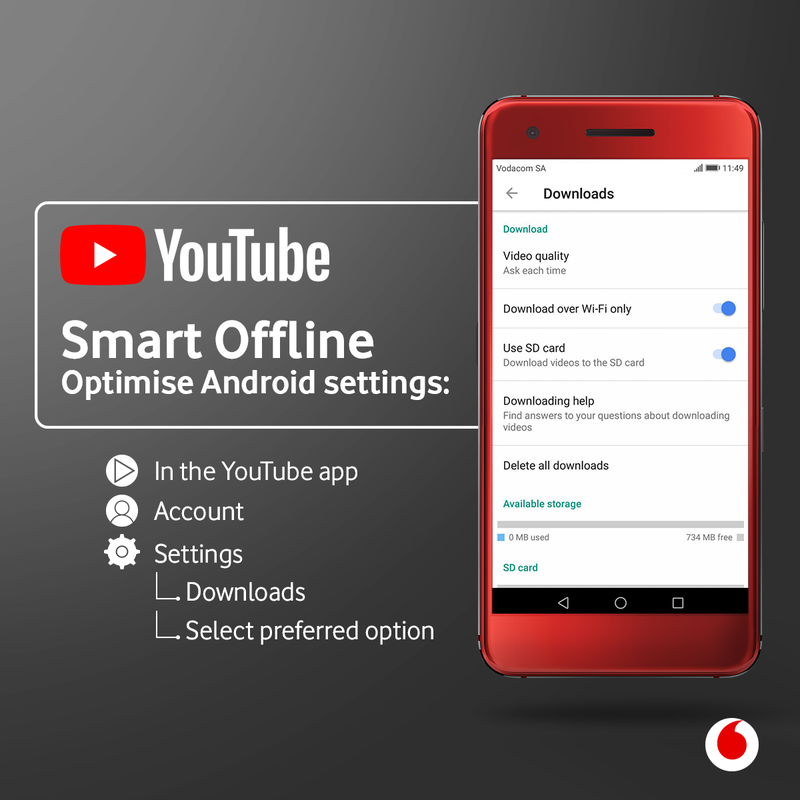 Android: Launch YouTube > Navigate to Account (top right) > Settings > General > Upload quality > select 360p for the smallest file size and 1080p for the biggest file size. Note: Only video qualities available on your phone will display in the menu. 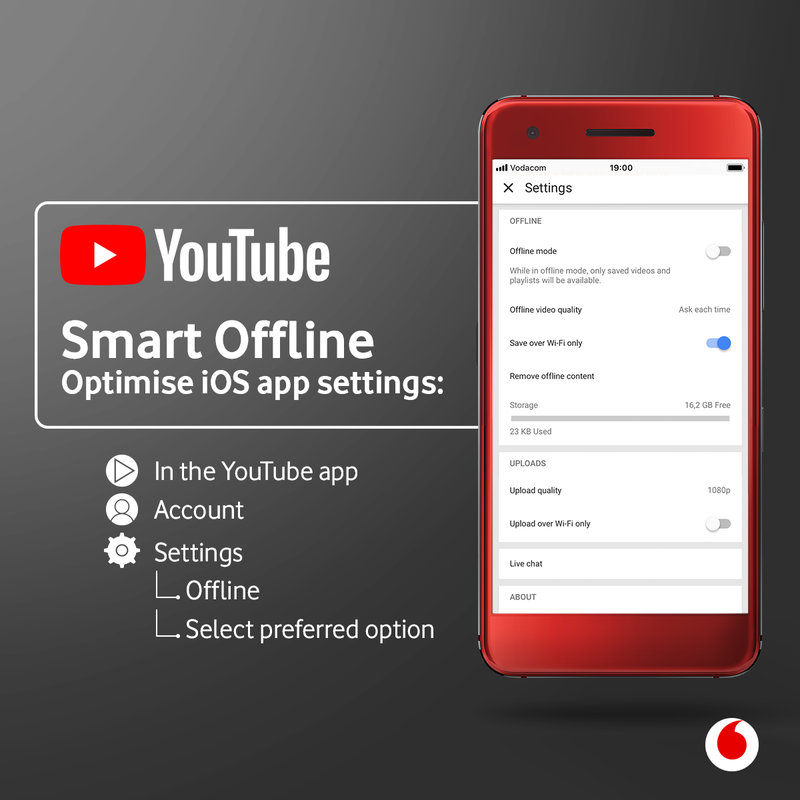 iOS: Launch YouTube > Navigate to Account (top right) > Settings > Upload quality > select 360p for the smallest file size and 1080p for the biggest file size. Android: Launch YouTube > Navigate to Account (top right) > Settings > Downloads > make sure Download over Wi-Fi only is in the ON position. We know that it can be difficult to work out exactly how much data you’re going to need, or how much data you are currently using. Try out this data calculator to understand how much data your most popular apps use. The best way to save money on data is to make sure you have an active data bundle. You can buy data bundles quickly and simply on the My Vodacom App. Also check out Vodacom Ticket for awesome deals on data for WhatsApp, social media, gaming and more.